Weighty Matters: Guest Post: Coming Soon to a Restaurant Near You - "Teen" Menus? Guest Post: Coming Soon to a Restaurant Near You - "Teen" Menus? A few days ago, RD Jane Cunningham wrote to me about something she'd never seen before. 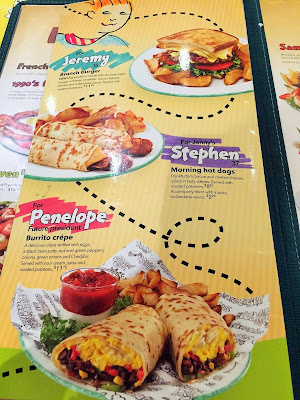 A "teen" menu at a local breakfast restaurant. Looking at the menu and reading her thoughts, I asked her if it'd be all right to post here and she graciously agreed. A couple of weeks ago, my husband and I took our 3 daughters- twins age 10 and our youngest age, 6 - on a weekend away in Halifax (we live 3 hours away). We decided to eat at Cora’s for breakfast. We hadn’t been there in awhile so we were excited to go. Despite Cora’s not so healthy custard filled crepes and monster size portions, I felt good about the generous portions of fruit and hey, it was a treat for us. My jaw dropped to the table when I saw the insert in the regular menu – a teen menu. In my business of nutrition and healthy food policy I didn’t think anything could surprise me when it came to restaurant food, or food marketing aimed at children and youth. As you can see from the pictures, the breakfast menu aimed at teens is deplorable – let’s start the day with Oreo cookies, poutine, and hotdogs! What was even more disturbing was the lack of/minimal fruits and vegetables on the teen menu, compared to the regular menu which is bursting with fresh fruit on every page. This experience is not new, unfortunately, but I was so disappointed none the less. It made me reflect on the concept of ‘adult food’ vs ‘kids’ food’ and how there exists a perception that there is a difference between the two. This perception is influenced by advertising and marketing. Research that has explored this concept has shown that children think of ‘adult food’ as healthy, less processed, boring, fruits, vegetables and meat. While ‘kids’ food’ is perceived as being junk food, sugary, low in nutrients, and having fun shapes and colours. 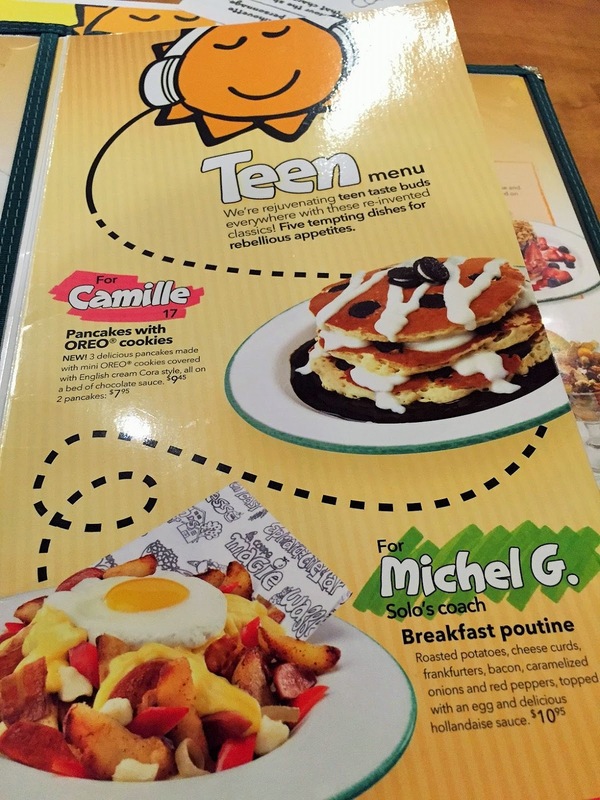 Cora’s teen menu is a great example of taking advantage of this perception. No fruits or veggies? Check. Sugary, high fat, and highly salt food? Check. Notice how they use language on their menu like, ‘5 tempting dishes for rebellious appetites’ to appeal to youth – making the food sound ‘cool’ and ‘fun’. Rebellion through junk food. Fascinating. Of course, my kids who are not teens started asking for the Oreo pancakes. With a Dietitian mother and a Dentist father, this request was quickly denied. However, I admit that we settled for the ‘child-size’ Nutella filled crepe. SIGH. I haven’t written to Cora’s to share my thoughts yet, but plan to. Jane Cunningham is a Professional Dietitian and is passionate about her work in healthy public policy and creating healthy food environments. 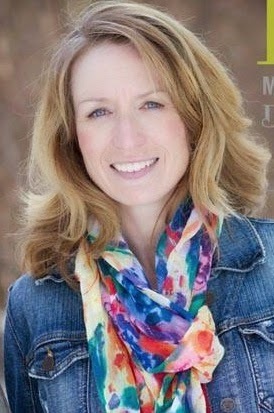 Jane lives in Yarmouth, Nova Scotia, with her husband and three daughters. When Jane is not at work or hanging out with her family, you will find her running long distances along the beautiful Atlantic Ocean.